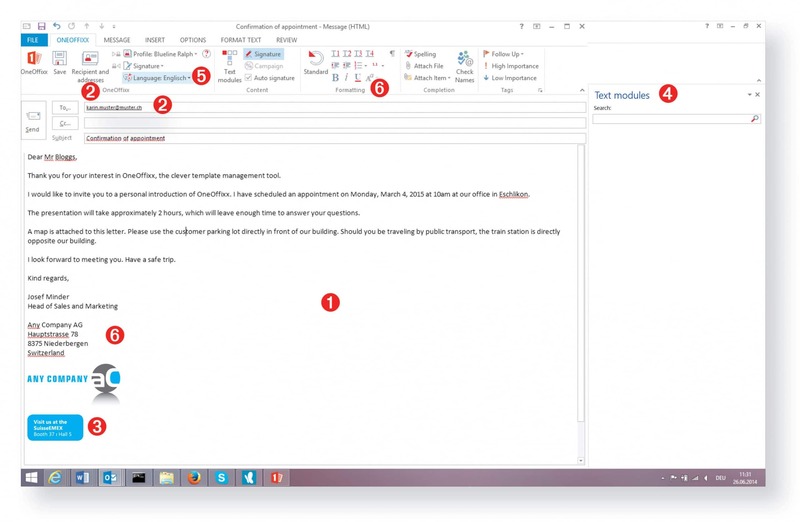 OneOffixx for Outlook templates: A smooth Email correspondence! OneOffixx: Products Simply clear: Overview on our range of products. OneOffixx for Word templates Simply perfect results in Microsoft Word... while simply saving time! 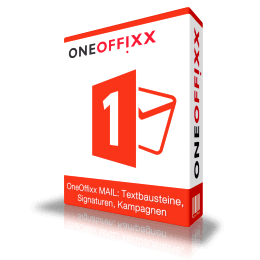 OneOffixx for Outlook templates Simply ideal emails with automatized signatures, text blocks and campaigns. OneOffixx for PowerPoint templates Simply professional presentations: From zero to Office hero with OneOffixx! OneOffixx for Excel templates Simply unified Excel tables with individual touches.. I am excited about OneOffixx, because it is reliable and extremely user-friendly. OneOffixx stood out, as it completely satisfies our demands. A professional cooperation based on true partnership with OneOffixx. OneOffixx Template Management: Get to Know the Benefits in 4 Minutes! OneOffixx facilitates the presentation of your company’s CI on all documents: The central management of email signatures gives a perfect overview on your data. Text modules are available both for documents and as Outlook templates, making your daily workflows run more efficiently. OneOffixx makes the simply impossible possible: Increase both output and quality with OneOffixx for Outlook templates! OneOffixx makes your eMarketing campaigns better, faster, easier...and more fun! Create professional image or text campaigns with OneOffixx for Outlook templates: Take your announcements for workshops and fairs, as well as your advertising campaigns to the next level! Simply easy: You can run your timed campaigns for separate organizational units in different languages, while the data management is centralized. From zero to marketing hero with OneOffixx! Comprehensive layouts and templates for emails, e.g. for single business cases or offers. Email signatures: centrally managed layouts with individual contact data. Supports portrait photos and vectorized signatures. Private and commonly used text blocks with drag’n’drop function. Possibility of selecting different senders, e.g. for different companies or in case of temporary staff replacements. Internal and external emails: OneOffixx automatically distinguishes between internal and external correspondences and adds the correct signature to your email. Outlook templates in multiple languages: Adjust your correspondence to the recipient’s language. eMarketing campaigns in accordance with time zones, languages and organizational conformities, which can be automatically attached to external emails. OneOffixx is the Swiss solution for Office documents and emails guaranteeing a 100% conformity of your company’s corporate design. It is a product of Sevitec Informatik AG, which was founded in 1999. Today, more than 25 software engineers and application developers contribute to the success of OneOffixx. Since 2017, our sister company OneOffixx GmbH supports all clients outside of Switzerland.